The 2014 annual WXJM Cool-Aid Benefit Show will quench your immense punk rock thirst like a fruit punch to the gut. 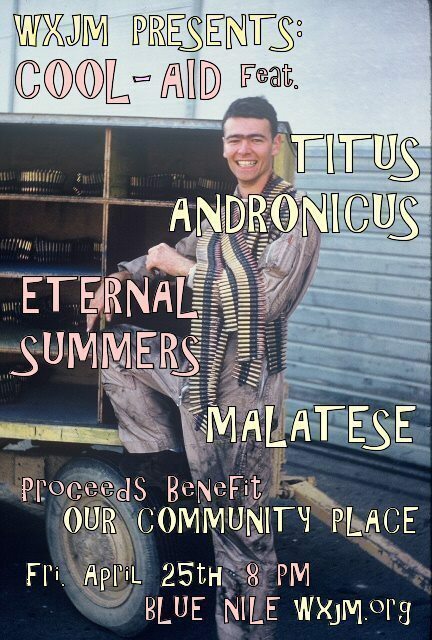 Performances from Hburg psych-punks MALATESE, vibrant 90’s alt-rockers ETERNAL SUMMERS, and historic indie-rock legends TITUS ANDRONICUS will need an era of reconstruction after they Blue Berry Blast through the stonewalls of the Blue Nile like a pitcher full of concentrated POWER JUICE!!! This year, all proceeds from ticket sales will go to Our Community Place, a really cool center that has been providing the people of Harrisonburg with meals, resources, and development since 2008. Tickets are $10 presale / $11 at the door.